Gold hoops make everything better. It’s just the truth. What’s your hoop style? There’s the skinny, the thick, a small hoop, the J.Lo size. Personally, I can’t stop wearing a thicker, hollow hoop aka the Sade. But no matter the style, they go with everything, and nothing adds more polish to jeans and a t-shirt. 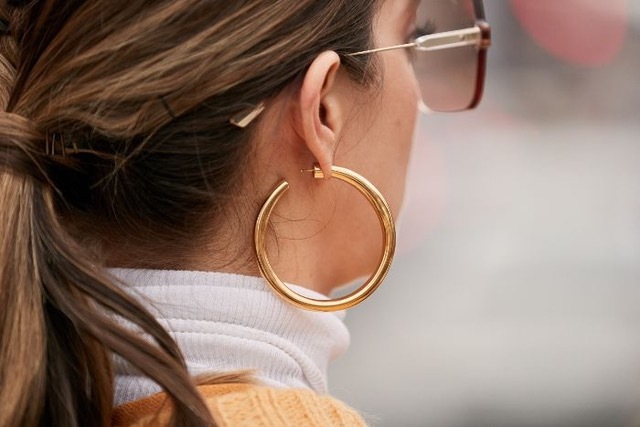 Though they are a style staple, the gold hoops trend has been going strong for the past few years, which just means we have a lot more options to choose from than the standard. This Louise Olsen pair is elegant but artistic, like something a really cool art teacher would wear. Laura Lombardi’s become a cult favorite designer thanks to her line of interesting and trendy earrings that also happen to be affordable. This pair of gold and silver mixed metal ones is perfect for anyone getting on the silver trend a little ahead of the curve. Mango’s pair of embossed gold hoops is hollow and comfortable. I know because I wear them almost every day. Maria Black‘s thick, twisted pair is a nice take on the standard. No matter your choice, you’ll be styling. Shop away darlings.